Now that the shop space is cleared and cleaned out, it’s time to grab some tools and start building all that new shop furniture. 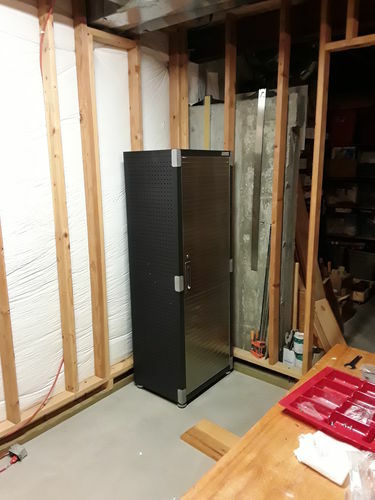 Here is the first of the three storage cabinets, completed and moved to its spot in the corner. As I suspected, the unit is extremely well designed and sturdy, even though it took over an hour and about a million screws to assemble it. I particularly like the adjustable feet at the bottom to facilitate with leveling. The cabinet is 5’5” tall, 24” wide and 18” deep, and features a center fixed shelf and two adjustable shelves. The only thing I am not totally thrilled about is that the sides of the cabinet are steel pegboard. I can foresee a lot of dust getting inside, but that can be compensated for by affixing some poster board or cardboard inside to cover the perforations. Another nice feature of the cabinet is a locking handle with a key. Nice touch if one has little tykes running around. Next up is construction of the two workbenches to be placed side by side. These feature a 2’ x 4’ breadboard wood top. Quite attractive. Again the bench construction is solid, and like the cabinets, features leveling feet. The back wall is again steel perf-board panels. 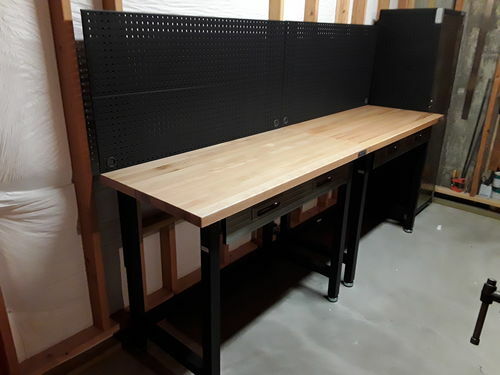 The bench kit included a couple of nice surprises – a rubber mat for the tool drawer bottom, and an assortment of pegboard hooks and holders. Two steel dividers were also provided for the drawer. To top it all off, some electrical cord access holes are included in the backboard, complete with rubber grommets. These benches are quality all the way! 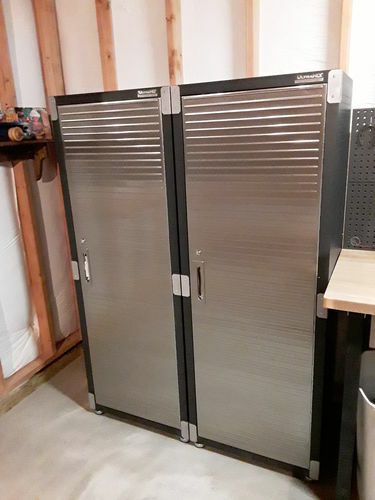 Finally, after much wrenching and screw-drivering (by the way, all the furniture kits included these tools), I had the remaining two cabinets built and moved into place.